It’s strange to be planning a summer vacation right now, when the neighborhood kids just started back to school. I’m so ready for autumn. I want to see the fall leaves dance outside my window and wear a cardigan and put a pumpkin on the porch. I want to eat my weight in Honeycrisp apples. Do you remember the line in “You’ve Got Mail,” when Joe (Tom Hanks) writes that autumn makes him “wanna buy school supplies”? I would take that bouquet of newly sharpened pencils he offers Kathleen (Meg Ryan) and write my name in cursive on the first page of a brand new notebook. But until then, I’ll settle for another batch of Cranberry, Coconut and Almond Granola. I think of this granola as a compromise food, something that can carry you from one season to the next. The shredded coconut, orange juice and honey are pure summer, but the oats, maple syrup and dried cranberries whisper that fall is on the way. It’s a granola with just the right balance of crunchy and chewy, sweet and salty (thanks to a liberal pinch of sea salt). I’ve been eating it for breakfast every morning, sprinkled very generously over the top of some low-fat yogurt and fresh fruit (mainly chopped peaches and strawberries), but I can testify that’s it’s also delicious with milk, over ice cream, or grabbed by the handful, straight out of the jar. I might even share with my sister, when I bring her kids a big box full of fingerpaints. If you substitute quick-cooking oats for the rolled oats, be sure to check the oven frequently. They brown much faster. Heat the oven to 325 degrees F. Line a rimmed baking sheet with parchment paper or Silpat®. In a medium saucepan over, combine the honey, maple syrup, orange juice, butter, and almond extract. Bring to a boil over medium heat. (Don’t let the mixture boil over.) Reduce heat, and simmer for 5 minutes, stirring often, until the mixture thickens a little. 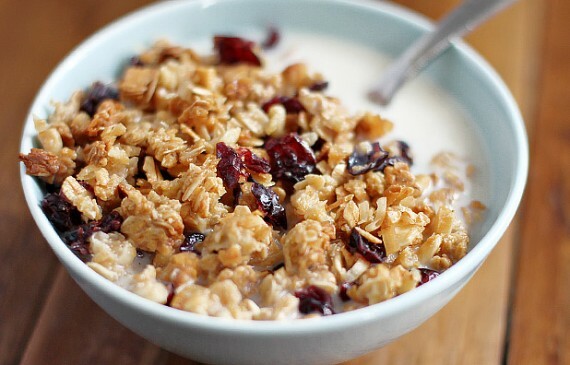 Mix the oats, coconut, almonds, and sea salt in a large bowl. Pour the hot honey mixture over the oat mixture. Stir to coat thoroughly, and spread evenly on the baking sheet. Bake for 14 minutes, stirring occasionally. Add the cranberries, and bake for another 15 to 18 minutes, stirring occasionally, until golden brown. Remove from the oven, and let it cool completely. Storage: The granola will keep in an airtight container at room temperature for up to 2 weeks.